The theme for this week’s Lasang Pinoy Sunday is CRUNCHY. For this theme, I enter the Hazelnut Pralines that I learned how to make for the first time when I made the Filbert Gateau for Daring Bakers. This recipe reminded me of the peanut pralines we used to buy in Baguio where I grew up. Now that I know how to make it, I realize how easy it is to make. I should have been making this a long time ago! Making these praline is really simple. Get a couple of chopped nuts of your choice. It just so happened that the recipe called for hazelnuts so that’s what I used but you can use peanuts, walnuts, pecans, or whatever else you like. In a skillet or heavy bottomed pan, place a cup of sugar over medium high heat and let it melt without burning. Just until it’s melted and caramel colored. 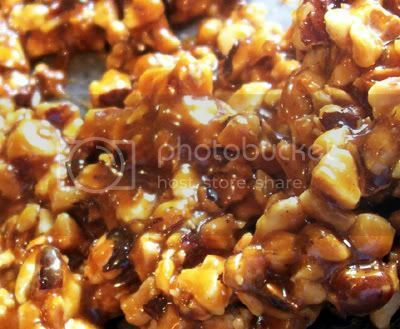 Add the nuts, and working quickly, stir it into the syrup and pour the praline on a lightly buttered parchment paper or wax paper and spread out as evenly as you can. Let it cool until CRUNCHY. The praline can be stored in a cool, dry container for several days if it lasts that long. Enjoy! For other Lasang Pinoy Sunday (LaPiS) entries, make sure you visit Ces’ LaPiS Roundup. hi jmom! wow! that looks so rich and crunchy! parang sumakit ang ngipin ko. hee hee! That looks definitely yummy and crunchy! Thanks for dropping by my blog! oops sorry posted Ces’ link LOL! yea i miss our baguio version too. oh wow! that looks deliciously crunchy! great post! That looks yummy. Thanks for sharing the recipe. Ummm… thanks for sharing the recipe. I might try to cook it. so we won’t have to buy. My crunchy post is up HERE. Hope you’ll check it out if you have the time. Thanks!